It has a modern, shared kitchen and many outdoor activities are available. Decorated simply, the dormitory rooms come with bunk beds and bed linen. Towels can be rented on site and lockers are available. Guests have access to shared bathrooms. The shared kitchen is equipped with an oven and ceramic hobs, as well as a dining area. A laundry service is available for a supplement. Many outdoor activities are possible in the area, such as surfing, sailing, kayaking, hiking and climbing. Staff can provide information on these activities and they also rent snorkeling equipment and underwater cameras. All of the rooms in Galera del Mar have modern private bathrooms and a work desk. Some also have a small balcony. The Galera del Mar guesthouse has a bar-restaurant offering light breakfasts. The Don Cayo Golf Course is just a short drive away, while Benidorm is about 20 km away. There is free onsite parking, and a supermarket about 300 metres away. Rooms at La Paloma feature simple décor and are equipped with air conditioning. They also include a private bathroom. The tour desk at the La Paloma guest house can provide information on the area and help to organise excursions. Free private parking is available on site. 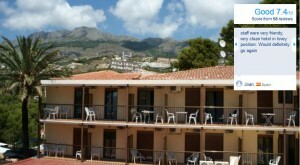 Denia Meeting Point is located a 5-minute walk from Denia Beach. 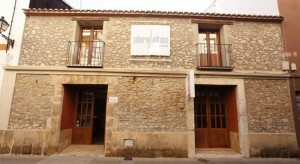 This modern hostel offers air-conditioned dormitories and a large terrace. Free WiFi and free breakfast are included. Dormitories at the Denia Meeting Point have bright décor and wooden floors. They include individual storage lockers. All rooms have access to colourful shared bathrooms. You can relax in the hostel’s communal lounge, which includes a TV. Vending machines are available 24 hours a day. There are many shops, bars and clubs in the streets around Denia Meeting Point. The tour desk offers information about the town and the Costa Blanca. Alicante and Valencia are both an hour’s drive away. This is our guests’ favourite part of Denia, according to independent reviews. They gave the location an excellent score of 8.6! This property has been on Booking.com since 22 Mar 2010.